Royal Enfield has launched its special limited edition despatch range of motorcycles. Though Royal Enfield is significantly and continuously improving its production capacity, the company is unable to cater to the humongous demand. The latest production capacity stands at 52000 units and is still improving, all of which are manufactured out of the single production facility in Chennai, India. The bikes are manufactured for both domestic and international markets. Very recently, Royal Enfield overtook the cruiser bike major, Harley Davidson with respect to international sales. These Despatch motorcycles are based on Royal Enfield’s top model, the Classic range of motorcycles. This limited edition motor cycle will be offered in two colors, a Desert Storm and a Squadron Blue color. 200 units will be manufactured in each color. This motorcycle stands as a tribute to the war heroes of the world wars. The important aspect is that, these unique color pattern is achieved by hand and that really makes these special. To add some more special treatment, each motorcycle bears a unique embossed aluminum hallmark detailing particulars of its manufacture like (001 of 200). The bike also carries a special leather seat made of a thicker Italian hide. Another feature that differentiates these Despatches from regular classics is that the engine and crankcase are painted in matte black. However, these bikes command a serious premium over the regular classics. These bikes are priced at 2.17 lakhs ex-showroom Delhi, which is a solid 50,000 rupees more expensive than a regular classic 500. The technical specification remains the same as a regular classic 500, with the engine displacing 499 cubic centimeters and churning out 27.2 bhp of power and 41.3 Nm of torque. The booking starts in two days and remember that you need to be quick to be one among those 400 lucky customers to enjoy this additional royal treatment. 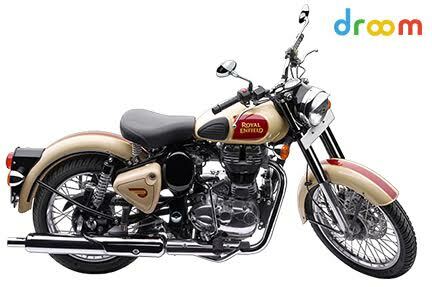 Find a huge inventory of Royal Enfield motorcycles on droom.in – India’s first marketplace for automobiles. Download the app now! Itˇs really a cool and helpful piece of information. Iˇm glad that you shared this helpful information with us. Please stay us up to date like this. Thank you for sharing.